Scott is the Executive Director of Bike Pittsburgh. An everyday bike commuter, who has cycled across the country, he is a vocal advocate for safe streets for people who ride bikes and walk. He is an alumnus of Carnegie Mellon University, where he earned a B.S. in Public Policy and Management in 1999. Scott has been the Executive Director of Bike Pittsburgh since 2005. 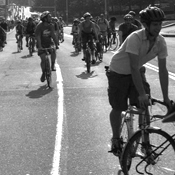 Bike Pittsburgh has been recognized nationally as one of North America’s strongest biking and walking advocacy organizations, winning “Advocacy Organization of the Year” in 2011 from the Alliance for Biking & Walking. Scott is also on the board of directors for Pennsylvania Walks and Bikes and the Alliance for Biking and Walking.